Bridget White-Kumar, author of six Anglo-Indian cookbooks, reflects on culture and tradition from the Colonial Anglo-Indian Era. I hail from a charming little mining town called Kolar Gold Fields, in the erstwhile Mysore State, now a part of Karnataka. I was born into a well-known Anglo-Indian family in KGF, tracing our roots back to British, Portuguese and Dutch ancestry. The Kolar Gold Mines were owned and operated by the British mining firm of John Taylor & Sons for almost a century. Four generations of my family lived and worked in the KGF Mines. The town had an old-world bonhomie about it, and was known for its affectionate and warm people. It was unique in its secular and egalitarian society. KGF was known as ‘Little England’ due to its colonial ambience, and European and Anglo-Indian population. Our lives were greatly influenced by the culture and ways of the Raj. There was no dearth of British goods in the 1940s and 50s. Goods were imported from England and sold through The English Ware House, Spencer’s Stores and various clubs in KGF. For as long as I can remember, there was always a good supply of Kraft Cheese, Tuna Fish, Polson’s Butter, Colman’s Mustard, Sardines, Baked Beans, Jams, Jellies and Quaker Oats, in our home. Our food habits were typically Anglo-Indian. Breakfast was normally a bowl of porridge, toast with butter, jam and eggs. Sundays saw sausages, bacon or ham on the table. Lunch was a typical Anglo-Indian meal consisting of steamed rice, beef curry with vegetables, ‘pepper water,’ and a vegetable side-dish. Dinner was always dinner rolls with a meat dish; it was an unwritten rule that no one ate rice at dinnertime. We ate beef or mutton every day, fish invariably on Wednesdays and Fridays, and either Pork, Chicken or Duck on Sundays. My mum made asimple and delicious dessert, Bread and Butter Pudding, practically every Sunday. She followed an old handwritten recipe that was handed down to her from her grandmother. It was real comfort food; on a cold rainy night, I still feel nostalgic for my mum’s warm Bread Pudding. My mum was an exceptional cook; even simple dishes tasted delicious when she cooked them. She was versatile and imaginative in the kitchen. She would improvise and turn out the most delicious curries with whatever ingredients were on hand. Our Ayah would grind the masalas for the curry on the grinding stone; in those days everything was prepared fresh and from scratch. Ready-made curry powders were unheard of. And since we had no gas or kerosene stoves back then, every dish was cooked over a wood-fired stove, which only added to the wonderful taste! Lunch on the weekends were special. Saturday lunch was invariably Mince Ball Curry, Saffron-Coconut Rice and Devil Chutney. On Saturdays, we only had half-days at school, so we were back home by 12.30 pm, ravenously hungry and we’d be assailed by the delicious aromas of mum’s cooking even before we reached our gate. The mince for the Ball Curry, had to be just right. The meat was brought fresh from the Butcher Shop, cut into pieces, washed and then minced at home. Like every Anglo-Indian family, we had our own meat-mincing machine, which was fixed to the kitchen table. The freshly ground meat from the machine was then mixed with the required ingredients, shaped into even balls, then slowly dropped into the boiling gravy and left to simmer in a rich coriander and coconut sauce. The curry was famously known as ‘bad-word curry.’ The word ‘ball’ was considered a bad word in those days, and family elders wouldn’t dare utter it for fear of committing a sin. The Saffron or Yellow Coconut Rice was always prepared with freshly squeezed coconut milk and butter. Like the meat mincer, the coconut scraper was another important appendage of the Anglo-Indian kitchen, fixed firmly to the other side of the kitchen worktable. Sometimes, two fresh coconuts would be broken and grated for the Coconut Rice. The grated coconut had to be soaked in hot water and the thick milk extracted. For every cup of rice, twice the quantity of coconut milk was added – a little more would make the rice ‘pish pash’ or over-cooked, and a little less would leave the rice under-cooked. The raw rice and coconut milk would then be simmered with ghee or butter, saffron, bay leaves and a few whole spices of cinnamon, cardamom and cloves till the rice was cooked perfectly. My favourite dessert was Bread and Butter Pudding. My mum made this simple and delicious dessert practically every Sunday. She followed an old handwritten recipe that was handed down to her from her grandmother. It was real comfort food; on a cold rainy night, I still feel nostalgic for my mum’s warm Bread Pudding. The Anglo-Indian community has a long history that can be traced back to the early part of the 16th Century, to the advent of the Portuguese, Dutch and Spanish, who came to India to trade in spices. Towards the latter half of the 18th century, the British made their presence felt with the establishment of the East India Company. With inter-marrying, a new multi-racial community came into existence, which evolved into the Anglo-Indian community. In a world fast morphing into a Global Village, many of the old traditional colonial dishes are not prepared in Anglo-Indian homes, as recipes have died with the older generation who cooked with intuition and memory rather than from written notes. Anglo-Indian cuisine therefore evolved over many hundred years as a result of reinterpreting a quintessentially western cuisine by assimilating ingredients and cooking techniques from all over the Indian sub-continent. Thus a new contemporary cuisine came into existence making it truly ‘Anglo’ and ‘Indian’ in nature; neither too bland nor too spicy, but with a distinct flavour of its own. It became a direct reflection of the new colonial population. The British did not like Indian food and taught their khansamas to prepare dishes from their own hometowns. However, over a period of time, a few local ingredients were added to the dishes, and they experimented with making puddings and sweets using local ingredients. Their soups were seasoned with cumin and pepper, roasts were cooked in whole spices like cloves, pepper and cinnamon, and rissoles and croquettes flavored with turmeric and spices. Mulligatawny Soup, Meat Jalfraze, Devilled Beef and Pork were some of these early innovations. Anglo-Indian Cuisine is a gourmet’s delight mostly because it makes use of spices like pepper, bay leaves, cloves, nutmeg, and cinnamon. Indian garnishes like chillies, cumin, coriander, turmeric, ginger, garlic, and vinegar are also added in moderation. Yogurt and milk are used in certain preparations to offset pungency. Many dishes have rhyming alliterative names like Doldol, Kalkal, Ding-Ding and Posthole! The very nomenclature of these dishes is unique and original, and synonymous only with the Anglo-Indian community. However over a period of time, Anglo-Indian cooking became more Indian than British and more regional. Local ingredients and flavours of a particular region were incorporated in the dishes while the basic ingredients remained the same throughout the country. Coconut-based curries were popular in Anglo-Indian dishes in the south, while mustard oil and fresh water fish were popular ingredients in the Anglo-Indian dishes of Calcutta and West Bengal. And a strong Mughlai influence seeped into Anglo-Indian dishes cooked in Lucknow and parts of North of India. But today, in a world fast morphing into a Global Village, many of the old traditional colonial dishes are not prepared in Anglo-Indian homes, as recipes have died with the older generation who cooked with intuition and memory rather than from written notes. 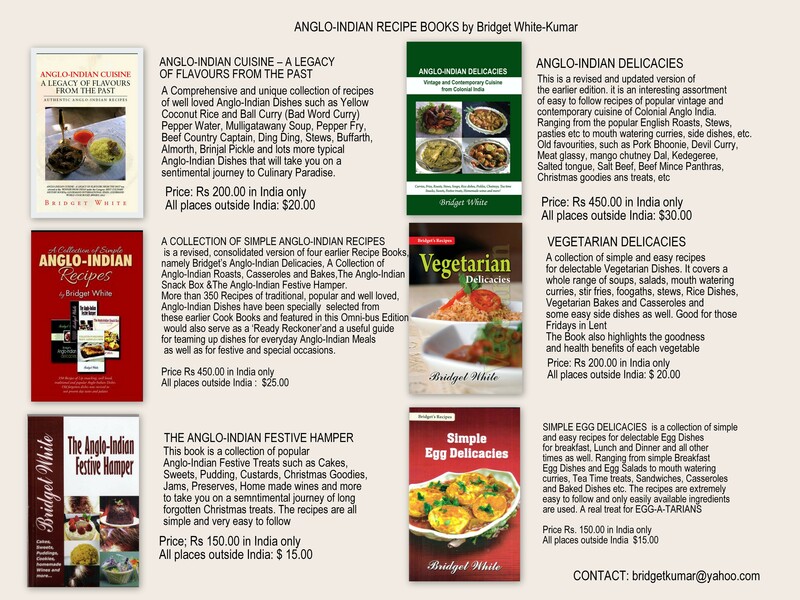 With the intention of preserving those authentic tastes and flavours, I have published six recipe books exclusively on Anglo-Indian cuisine. This personal collection of recipes was compiled with the intent of reviving the old tastes of the colonial era, and thereby preserving the culinary culture and heritage of the Anglo-Indian Community. 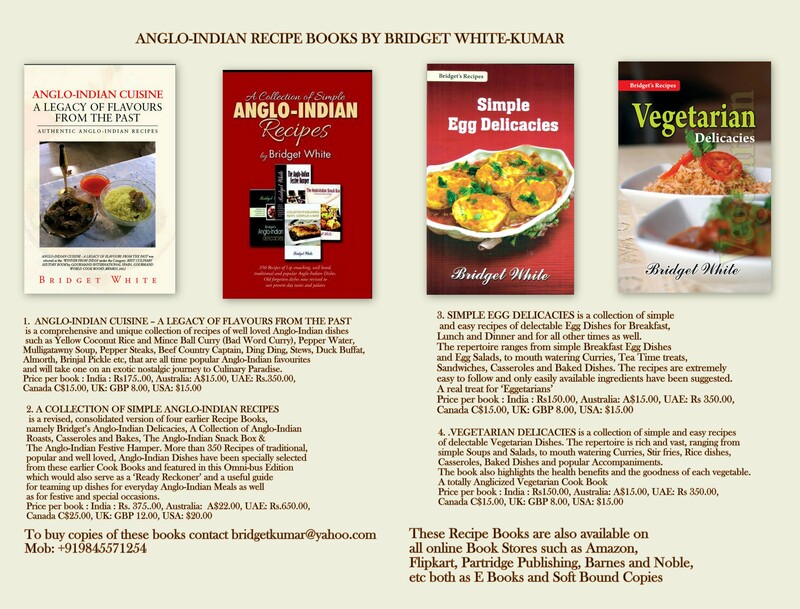 Posted on January 13, 2017 by Bridget White-KumarPosted in UncategorizedTagged Anglo-Indian Cuisine, Baked Beans, Bangalore, Bay Leaves, Beef Curry, Bread And Butter Pudding, Bridget White-Kumar, Calcutta, chicken, Cinnamon, Cloves, Coconut Saffron Rice, Colman's Mustard, Colonial Cuisine, Coriander, Cumin, Devil Chutney, Devilled Beef, Ding Ding, Doldol, Duck, English Cuisine, Fusion Cuisine, Ghee, Indian Cuisine, Kalkal, Karnataka, Kolar Gold Fields, Kraft Cheese, Krishanu Chatterjee, Meat Jalfreze, Mince Ball Curry, Mughlai, Mulligaatawny Soup, Mysore, Nutmeg, Oats, pepper, Pork, Posthole, Rice, Tuna Fish.